The 88: a crowning triplex of amenities — located on the top three floors, 912' into the sky — that spans dining, entertainment, fitness, pool and spa, abounding with cinematic views. March & White—a world-renowned British design practice based in London, New York and Los Angeles—have finished every residence with a specially-designed palette, masterfully amplifying space, light and the iconic building’s architecture. Are you currently represented by a broker? please contact the sales gallery. Your studio home has an enormous, nearly wall-sized window, framing the New Downtown’s picturesque scenery like a painting. It has wide white oak floorboards, high ceilings that draw the eyes upward and a divider whose middle rotates just so, allowing entertainment units to switch from living to bedroom. Slice, dice and simmer in a modern, clean-lined kitchen. Every countertop and backsplash is covered in marble—customised in Ancient Grey, Silver Brown Wave, or Fior di Pesco Carnico, depending on your residence’s palette. Even the faucets are unique, designed just for 125 Greenwich Street by March & White’s London studio. The most casual of meals are elevated—transformed to impressive affairs—with panoramas of the Hudson as their backdrop. The rounded glass wall and open-plan architecture amplify entertaining space, and imbue your dining quarters with an easy, laidback elegance. Mirroring the clean, cool beauty of your residence, this March & White-designed bathroom is awash with expanses of Calaca a Covelano marble, as well as walnut finishes and fine polish nickel fixtures. Like the space-doubling, mirrored shelving and long shower, the below-the-sink cabinet looks as seamless as it is functional. Soak up Manhattan’s splendor from your own private observatory, with panelled white oak flooring at your feet. At every hour—and in every light—scenes of the New Downtown and the World Trade Center unfurl before you. The only thing between you and the elements is a premium climate control system and a breathtaking expanse of glass. 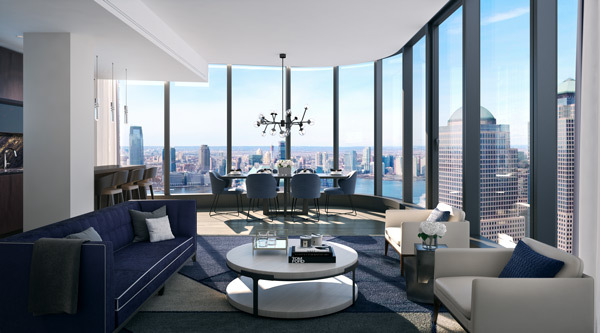 125 Greenwich Street offers an exclusive chance to see the city from a new perspective: your private sanctuary in the sky. On the top three floors is The 88, a first of its kind, 15,000-square-feet amenities space for residents, and a tranquil counterpoint to the hustle below. From the ground, 125 Greenwich Street is an elegant architectural form, its curved glass and antique bronze-finished mullions mirroring the sky. The exposed concrete wall is the building’s structural backbone: a slim, powerful and ever-visible spine. All images are artists’ renderings for illustrative purposes only. Sponsor reserves the right to make substitutions of materials, equipment, fixtures and finishes in accordance with the terms of the Offering Plan. The complete offering terms are in an offering plan available from the sponsor. File no. CD#15-0336. Sponsor: VS 125 LLC, c/o Bizzi & Partners Development LLC, 55 East 59th Street, New York, New York 10022. Equal Housing Opportunity. You can visit 125Greenwich.com without revealing any personal information. Our web servers collect the Internet Protocol addresses, but not the e-mail addresses, of visitors. This information can measure the number of visits, average time spent on the site, pages viewed, and other such statistics. In addition, You may be asked for information that identifies you, including your name, e-mail address, mailing address, zip code, telephone number, fax (collectively, "Personal Information"). You may also elect to provide such information to us by sending or responding to e-mails regarding certain listings or services offered on our Website. When you request information, we need to know your name, e-mail address, and mailing address. This allows us to process and fulfill your request. 125Greenwich.com does not sell, trade, or rent your personal information to others 125Greenwich.com may provide aggregate statistics about our customers, sales, traffic patterns, and related site information to reputable third-party vendors, but these statistics will include no personally identifying information. If you wish to access, update, or delete contact information or preferences, please send an e-mail to info@125Greenwich.com. Please be aware, however, that we cannot always ensure that such corrections or deletions will immediately be made in our database.